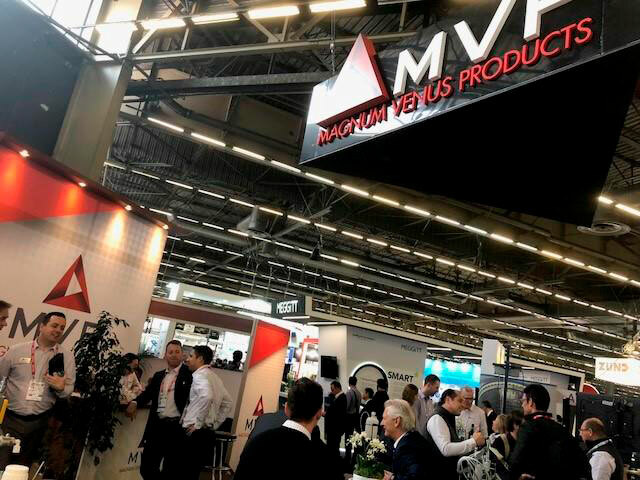 Magnum Venus Products (MVP) was one of the exhibitors at the 2019 JEC World tradeshow in Paris. The JEC Group, which is one of the most notable organizations in the global composites industry, represents, promotes and enables composite product development with global and local networking and educational services. As such, JEC World is one of the planet’s leading composites trade shows, dedicated entirely to the development of know-how and business connection channels and platforms supporting the growth and promotion of the composite materials industry, all of which explains MVP’s continued participation in this great event. JEC World 2019 encompassed three days and included over 40,000 composite industry professionals from 115 different countries. MVP was thrilled to host a variety of distributor teams from all over the world in our booth this year, allowing us to demonstrate our composite application innovations to a truly global market. As a leading manufacturer in composite application equipment since 1938, being a part of this international event is critical to our continued success, allowing us to keep a finger on the pulse of today’s industry trends while providing a sneak peek to advancements that will help propel the industry forward. One of the biggest advantages of attending 2019 JEC World was the ability to network with so many well-respected companies and individuals in the industry. Because it is an international event, MVP was able to connect with experts from all over the world, discussing challenges, ideas, and more—learning from the brightest minds in the business. The show also presented the results of the global composite market observatory, offering insights for the automotive, aeronautics, and building industries. This included several programs recognizing new technologies for these sectors, as well as the simulation, additive manufacturing, and consumer recreation (i.e., sports & leisure) industries. As MVP looks to continue our growth in all of these markets, our attendance at JEC World just makes sense. The educational experiences, coupled with the opportunity to make global connections, provided MVP with a greater, more far-reaching insight and understanding of the industry’s needs. Showcasing some of our revolutionary innovations for the market, MVP delivered talks on the thermoset printer project and displayed new products at our booth, including the Single Component Unit and more. In partnership with the Department of Energy’s ORNL (Oak Ridge National Laboratory) ORNL, MVP developed the first-ever thermoset printer. Unachievable with previous technology, this 3D printer is capable of printing large-scale thermosets, chemistries that are irreversibly cured from a prepolymer or resin. With this new technology, researchers and developers will be able to prototype more quickly and bring products to market faster, positively impacting the productivity of the additive manufacturing industry. The Single Component Unit, the most user-friendly material unloader on the market, offers easy loading and unloading of materials, has been designed with the safety of the operator in mind, and for portability. Its unique shape allows the user to move the unit over a drum of material, meaning a single user can operate it. It’s also distinctive because of its control panel accessibility and rugged yet operable frame design. MVP was honored to be part of JEC World 2019 and to share our innovations with such a dynamic audience of international industry professionals. It’s truly inspiring to be a part of such a rapidly evolving industry that focuses on delivering better solutions for so many markets and industries, both now and well into the future. If you have any questions about MVP’s new products or composite application equipment in general, contact us today.